By large margins, the American public has positive views of NATO, the North Atlantic Treaty Organization. Fully 77% say being a member is good for the U.S., and by about a two-to one-margin, more say they have a favorable view of NATO than an unfavorable one (53% vs. 25%). Yet the U.S. public is about equally likely to say the alliance is more important to its non-U.S. members (37%) as to say it is about as important to the U.S. as it is to other member nations (41%). Few (15%) consider the NATO alliance to be of more import to the U.S. than it is to other member countries. Though U.S. allies are largely viewed positively, a sizeable minority of the public expresses some reserve over the broader question of how much allies’ interests should be taken into account in U.S. foreign policy: While roughly half (51%) say the U.S. should take into account the interests of its allies even if it means making compromises with them, a sizeable minority (42%) says the U.S. should follow its own interests, even when allies strongly disagree. Views of the United Nations and the European Union remain substantially more positive than negative. 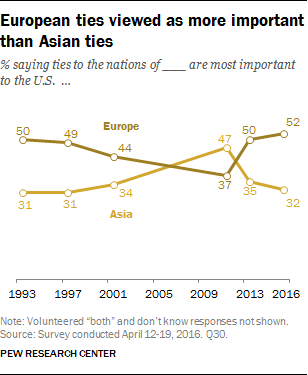 And Americans continue to say the country’s ties to European nations are more important to the U.S. than ties to Asian nations (52% to 32%). Most say NATO benefits the U.S.
About three-quarters of Americans (77%) say that, on balance, being a member of NATO is a good thing for the U.S. Just 16% say it is bad for the country. 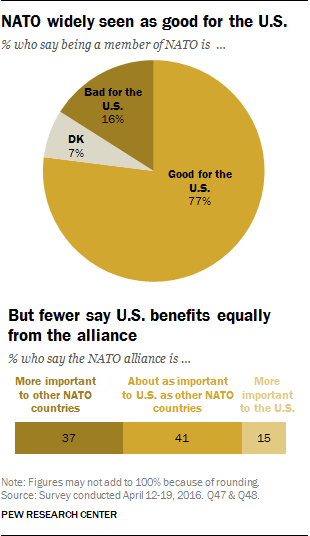 Although Americans are largely in agreement that the alliance is good for the country, there is less consensus about whether the U.S. and its NATO allies benefit equally from the alliance: 41% say the NATO alliance is about equally important to the U.S. and other NATO member countries, while nearly as many (37%) say the alliance matters more for other countries than for the U.S. Only 15% say the alliance is more important for the U.S. than it is for its NATO allies. Overall impressions of NATO are little changed in recent years: About half (53%) have a favorable opinion of NATO, while a quarter (25%) hold an unfavorable view of the alliance (21% do not offer an opinion). There are no significant partisan differences in ratings of NATO. 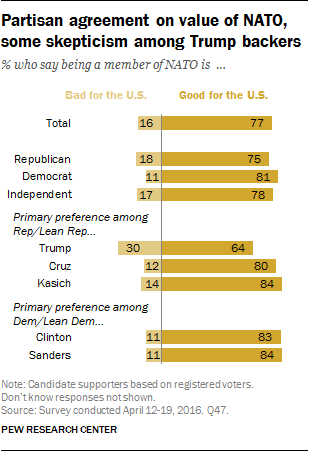 There also is broad partisan agreement that the NATO alliance is good for the U.S.: Three-quarters or more of Republicans (75%), Democrats (81%) and independents (78%) say the country’s membership in NATO is a good thing. But supporters of Donald Trump in the GOP primary contest are more likely than other GOP voters to express skepticism about NATO’s benefits to the U.S. Nearly two-thirds (64%) of Republican and Republican-leaning voters who back Trump say being a member of NATO is good for the U.S., compared with 80% of Cruz and 84% of Kasich supporters. Although there are few differences by party in views about whether NATO membership has been good for the country, Republicans (43%) and independents (41%) are more likely than Democrats (28%) to say the alliance is more important to other NATO member nations than it is to the U.S. 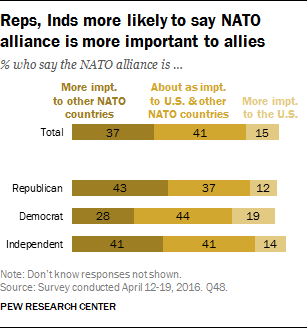 But no more than two-in-ten among any partisan group say the alliance is of greater import to the U.S. than it is to other NATO member countries. The public is divided along age and ideological lines when it comes to opinions on cooperating with allies. Overall, 51% say the U.S. should take into account allies’ interests even if it means making compromises, while 42% say the United States should follow its national interests even when the allies strongly disagree. Roughly half of Republicans (52%), including nearly identical shares of the party’s conservatives and moderates and liberals, say the U.S. should pursue its own interests even if allies strongly object. Democrats are more divided along ideological lines: 45% of conservative and moderate Democrats say the U.S. should follow its national interests even if the allies disagree, but just 20% of liberal Democrats share this view. Among people younger than 50, 55% say the U.S. should take into account allies’ interests even if it means making compromises; 39% want the U.S. to follow its own interests even when allies disagree. Older adults are evenly divided (46% say the U.S. should take allies’ interests into account, 46% say the U.S. should follow its own interests). There also are educational differences in these attitudes. A majority of those with at least a college degree (63%) say the U.S. should heed allies’ interests even if it means making compromises. Among those with less education, opinion is more evenly divided. A majority of Americans have a favorable view of the United Nations (64%); roughly three-in-ten have an unfavorable view (29%). Opinions of the UN have grown slightly more positive since 2013, the last time this question was asked, when 58% expressed a positive view. Views of the European Union also more positive than negative (53% favorable, 27% unfavorable), although the share of the public with a favorable view of the European Union is down slightly from 58% in 2014 to 53% today. There are wide partisan differences in views of both institutions. Large majorities of Democrats hold a positive view of the UN (80%) and the EU (64%). By contrast, only about four-in-ten Republicans (43%) report having a favorable opinion of either institution. Two-thirds of independents (64%) have a favorable view of the UN, and 54% say the same of the EU. Are ties to European nations or to Asian nations more important? When it comes to the relationships the United States has with European and Asian nations, about half of the public (53%) views ties with Europe as most important, while 32% say relationships with Asia are most important. One-in-ten volunteer that both are equally important to the U.S. These views are little changed from 2013 and over much of the last two decades. One exception was in 2011, shortly before a state visit from Chinese President Hu Jintao, when more (47%) thought Asian nations were most important (37% said European nations were most important). Young adults are divided: 46% of those ages 18 to 29 say Europe is more important, while roughly as many say Asia is more important (41%). Among older adults, particularly those ages 50 and older, clear majorities say European ties are more important. A 57% majority of those with no college experience say ties to European nations are more important than ties to Asian nations, while 29% say Asian ties are more important. By comparison, 46% of those with college degrees say European ties are more important, while 36% say Asian ties are more important. There are only modest differences in views among partisans: Roughly equal majorities of Republicans (60%) and Democrats (55%) say Europe is more important to the U.S than Asia. Roughly half of independents (48%) say European ties are more important, though they are somewhat more likely (38%) than either Democrats (29%) or Republicans (27%) to say Asian ties are of more import.